Enchanted by Emerald cut diamonds? You are most definitely not alone. 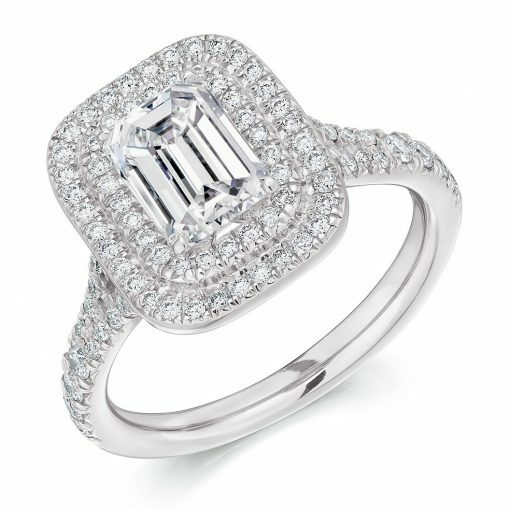 This strikingly elegant engagement ring design pays homage to the Art Deco Era, with it’s geometric shape and clean lines in full splendour. Featuring a central emerald cut diamond, embraced by two scallop set diamond halos, this style speaks elegance in abundance. Love this style but would prefer a coloured gemstone? This ring can be specially made with the gemstone and metal of your choice. Situated just off Grafton Street, here at Voltaire Diamonds we offer a personalised, relaxed and discreet service, enabling you to create the ring you have always dreamed of.